The Neoliberal University: Origins and Alternatives. 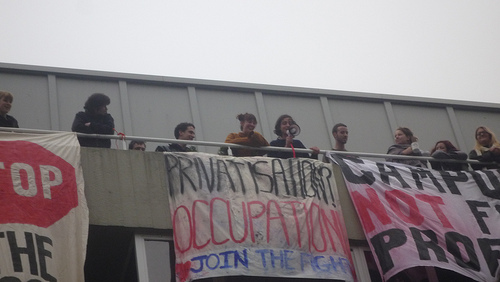 Home Editorials The Neoliberal University: Origins and Alternatives. UK Higher Education (HE) is being transformed. The introduction of tuition fees of up to £9000 per year induces changes across the whole system including the public purpose, administration and culture of universities. In this guest post, Hugo Radice assesses the transformation of HE as part of wider processes of neoliberal restructuring. Forty years ago universities in the UK were largely self-governing institutions for the higher education of a small Ã©lite of some 10% of the relevant age group. Although the chances of attending were heavily biased by secondary education and family background towards the children of the upper classes, fees had been abolished, and means-tested grants were available to all home students. The student movement of the late 1960s had largely subsided, the new universities of the 1960s had revitalised teaching and research, and the graduate job market appeared robust. Today, the universities are in thrall to the state over the content of their teaching and research, as well as their finances; and now that a vastly-expanded sector takes in 40% of the age group, they will graduate into a depressed labour market, as well as facing crippling debt burdens from loans for fees and living expenses. This transformation has been part of a much wider process of social change, in which the postwar model of capitalism based on an active state, consensus politics and the slow but steady redistribution of income has been replaced by a neoliberal model based on individualism, market competition and the rise of a plutocratic Ã©lite. At the heart of neoliberalism lie four key changes in our political economy: privatisation of public assets, deregulation of markets, the rise of finance and globalisation. Universities have been at the heart of this process in many ways. First, the public purpose of universities has been transformed, from the generation and dissemination of knowledge in itself, to enhancing the international competitiveness of the economy. Their teaching resources are aimed at the production of a labour force with knowledge and skills appropriate to that purpose; this extends even to the humanities students destined for employment in the media, education and culture sectors. Their research is ever more closely coordinated with the commercial agendas of big business, and expected to have an immediate ‘impact’. Second, the administration of universities is no longer structured around resourcing and planning real activities shaped by academic communities in the different subject areas, but on the imposition of uniform financial models that centre on individualised rewards and punishments. These models reflect a general shift in the public sector as a whole towards a ‘new public management’, based on the model of the profit-driven private sector that combines Stalinist hierarchical control and simulated internal markets for resources. Third, for both staff and students, the culture of universities has accommodated these transformations. Governed everywhere by quantitative targets and competition for places in ‘league tables’ on everything from graduate employability to research outputs to health and safety breaches, we have meekly accepted that higher education is no longer a cooperative effort to improve our understanding and our work, but about fierce competition with each other for the means to financial security. Students have been encouraged to see themselves as customers, whose chief goal is to obtain credentials that give an advantage in the job market, rather than to acquire knowledge as such. Not surprisingly neither staff nor students have accepted these extraordinary changes without demur. 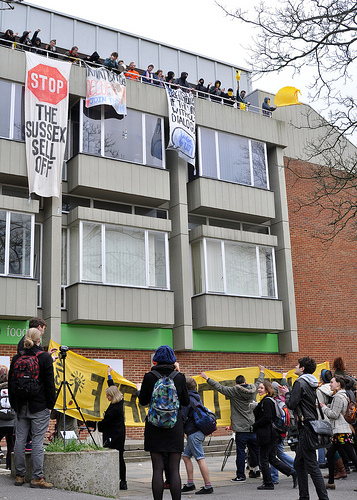 From the notorious Warwick occupation of 1970, in which the university leadership was found to have kept secret files on left-wing staff and students, to the anti-fees campaign of 2010-11 and the recent occupation at Sussex opposing the out-sourcing of services, there have been periodic eruptions of protest. 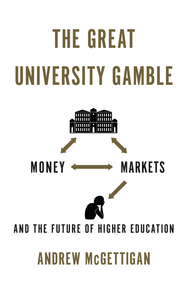 There has been a steady shift in the political allegiances of academics towards the centre-left, and the growth of serious critical analysis of the changes in the sector, the most recent example being Andrew McGettigan’s The Great University Gamble. The 2007 merger of the AUT representing academic and related staff in the ‘old’ universities, and NATFHE representing those in the ‘new’ post-1992 universities and the further education sector, has in principle strengthened the ability of staff to resist the steady erosion of pay and conditions. But there remains little by way of analysis, and above all debate, that could provide a long-term basis for an alternative model of higher education. Most academics are preoccupied with day-to-day issues, whether over individual career goals or over collective efforts to preserve some autonomy and self-respect. In the world outside, press barons and politicians happily stir up public resentment against the sector, based on the fact that both academics and the graduates they train continue to be rewarded with above-average incomes and life chances. 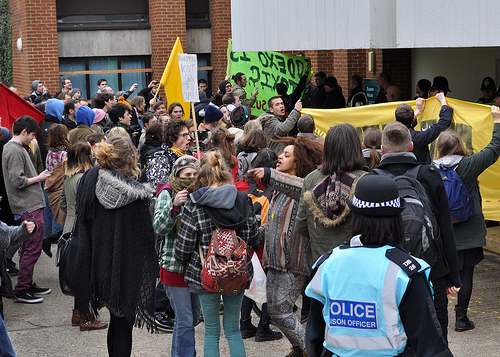 For the most part, our protests are informed by an agreed understanding that higher education used to be much better. Certainly, there was a time when studying was debt-free, when senates actually decided matters of substance, when research was untrammelled by commercial considerations, and when adult education departments freely disseminated knowledge outside the university’s walls. The 1968 call for ‘red bases’ in the universities appears in retrospect absurd, but surely no more than the idea that they could today become progressive zones based on the disinterested education of society at large, if they have to function within a wider society driven by individualism and the pursuit of wealth. After all, in that wider society socialism of any kind seems to be a dead duck: its communist variant is reduced to the absurdities of North Korea and the dwindling hopes invested still in Cuba; while the compromises that social-democracy has made with the wealthy and powerful have led to repeated electoral defeats and disappointments. However, from outside the ruling circles of high finance and their cheerleaders in parliament and the media, profoundly radical ideas have been raised during the present crisis on issues such as inequality, poverty, human rights and climate change. The prospects for humanity are increasingly uncertain, and millions are attracted, for want of anything else, towards a politics of fear and exclusion. The way forward can only be through reasserting the fundamental values of equality and solidarity. We need not only to be against the present order, but positively in favour of a realistic alternative that can attract widespread public support. Above all, we need to build this around equality: not of equality of opportunity, which inevitably favours the advantaged, but substantive equality of condition. Education ought to be geared not to the selective allocation of place and privilege, but to the development of skills and capacities for all citizens that would fit them to play a full and equal part, both in production for social needs and in their political determination. In such a world, universities could truly aspire to be universal, to act as genuinely open-source repositories of knowledge accessible to all. Hugo Radiceworked in UK higher education from 1971 to 2008. This blog is based on a longer paper, “How we got here: UK higher education under neoliberalism”, which is due to appear in a special issue of ACME: An International E-Journal for Critical Geographers (www.acme-journal.org) on higher education. The paper is available from the author (h.k.radice@leeds.ac.uk).